::: Off the Radar :::: Did They Predict An Award In The Near Future? Did They Predict An Award In The Near Future? Klaxons won the Nationwide Mercury Prize (it's sponsored now... ugh) for best British or Irish album last night in London in a surprise victory over Amy Winehouse, the Arctic Monkeys and Jamie T (also Maps, Bats for Lashes, Dizzee Rascal...). For those that do not know, the prize is known to be awarded typically to those British bands that are off the radar or less commercial (at least until the award is won). Think of it as the Bristish version of the Shortlist Music Prize. I have to admit I am content with their choice. Some of the nominees had already been nominated in previous years and won. So picking a new comer for this award seemed right. Nu Rave has probably one of the most irritating genre names created by industry execs and music snobs at an attempt to discredit the style but it caught on. 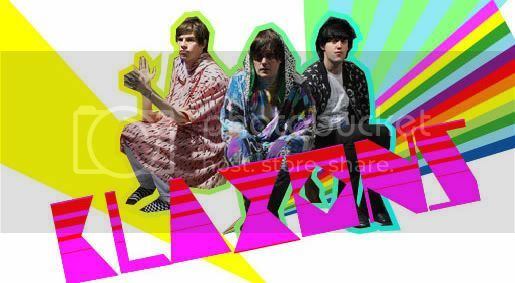 The reincarnation of 80's day-glo probably did not help it gain street cred but the Klaxons are a solid band. When the album was released the sound was new and (though heart-attack inducing) refreshing. It was rave music but played by a band. Novel at the time. Did I mention Golden Skans is my favorite song Klaxons song? The SebastiAn Remix is honestly pretty amazing. The way it starts it can be used to resuscitate a stopped heart. So let's forget that expensive designer hoodies and glo-sticks and check out an award winning band. Go buy the original on the Klaxon's debut Myths of the Near Future.